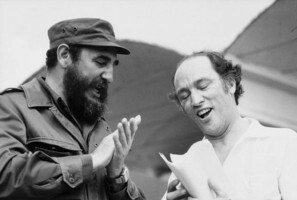 1 Caption: Cuban Prime Minister Fidel Castro and Canadian Prime Minister Pierre Trudeau join in a singalong during the P.M.'s Latin American Tour in January, 1976. 2 While few people objected to the invocation of the War Measures Act to catch terrorists, the subject of bilingualism was a different kettle of fish. Trudeau was determined to make French an official language along with English in all of the provinces. 3 In March 1971, Trudeau married Margaret Sinclair. For the Canadian public, who had been treated to his name being linked with a long list of celebrity women, it was a big step toward normalcy. 4 Margaret was less than half his age and produced three children; Justin, Sacha, and Michel. (Michel was presumed killed during an avalanche in British Columbia on November 13, 1998. His body was never recovered.) The Trudeaus separated in 1977 and divorced in 1984. 5 Prime Minister Trudeau supported Canada's involvement with NATO, but he also had his own idea about Canada's foreign policies. On more than one occasion, he angered the president of the United States. The first time was by opening talks with Communist China and then visiting Beijing. He also built a friendship with Fidel Castro of Cuba. 6 Trudeau and the Liberals were elected again in 1972. Two years later, there was a no confidence vote in the government. An election was held, and the Liberals won a majority government. 7 Pierre Trudeau was always known as a flamboyant character. While looking the part of an elder statesman, he did not always act like one. One time he slid down the banisters at Buckingham Palace, and another time he did a pirouette behind the Queen. 8 In 1978, he went on vacation to Morocco instead of being in Canada to greet the Queen during a visit. It was considered a major breach in protocol. Then in an about face, he invited Elizabeth II to the first Commonwealth Conference. It began a tradition that still continues.